"Birds of a Feather Flock to the Library"
Teen Tech Week always begins with a viewing of animated shorts. To follow the theme, several of the shorts were about birds. This year there were seven different videos to see which worked well as students did not all arrive at the same time. The one video that was most liked most by both middle and high school students was a Japanese film called Lost and Found that can be found here. This one was about a fox and dinosaur in stuffed animal form whose friendship prevailed over adversity. Since the 100 cubes that the library borrowed last year for Teen Tech Week were such a hit, this year the library borrowed even more. We started slow by making mosaics using only 49 cubes. Putting together the 225 cubes to make Albert Einstein took days, but the students who participated felt like they had really accomplished something. Using apps on the iPads, students had a choice of using a Merge Cube or Quiver Vision to play. There were five available apps to use with Merge. There was a bit of a learning curve with each app, but everyone who used it liked the cube. One of the most interesting apps for the Merge is 57° North which is an adventure story where you get to choose the outcome. This app has a nominal fee but seemed to be worth it. For Quiver, the students had a choice of sheets to color before making their pictures come alive. Our inspiration was this blog post, but these were the instructions that the students were given to make the bird. The students were given book pages, templates for bird and wing, pencils, scissors, glue guns, string for hanging, and glitter to create their bird. It was one of the first students of the day who decided to adapt the instructions and add wings on both sides of the bird to make it more three dimensional. Two high school students tossed out the templates immediately because they wanted to make their birds smaller. The pictures below tell the day's story. 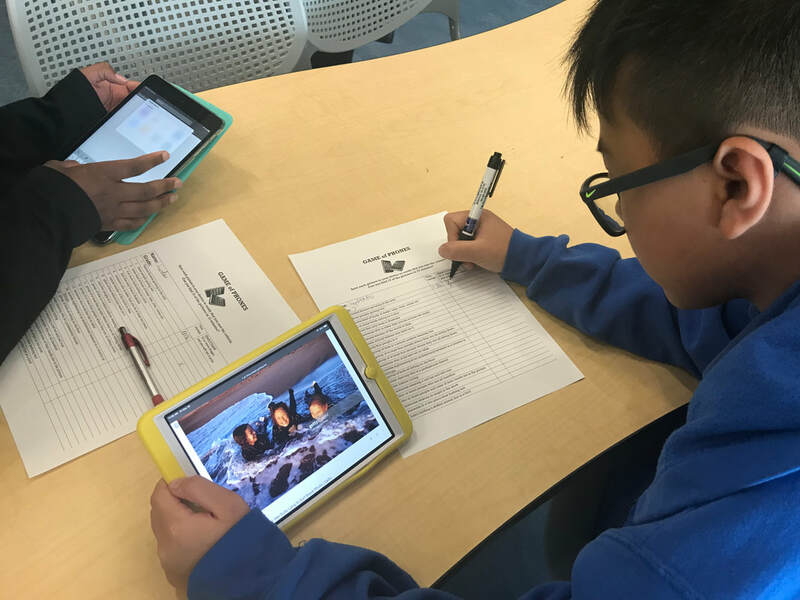 For the last day of the week, we had a scavenger hunt where students could use their phone or a library iPad to find pictures that met certain criteria. For those who played, they were suppose to find 15 pictures in 15 minutes. There were a choice of prizes for those who participated. This student picked her prize after getting all 25 call numbers correct. There was also an online quiz that ran the whole week where students had to find the call number for 25 different books from the PFTSTA Library. For the students who got all 25 right, they could pick a prize. For everyone else, they were given a mini Rubik's Cube. Read more about all the activities on the librarian's blog.